future directions for both research and clinical practice. Demonstrate awareness of the cost benefits of family therapy to other approaches such as group therapy, individual therapy, or 12-Step programs. Why should children or adolescents be involved in the treatment of a parent who abuses substances? What impact does a parent abusing substances have on his or her children? How does adolescent substance abuse impact adults? What is the impact of substance abuse on family members who do not abuse substances? Whether a child or adult is the family member who uses substances, the entire family system needs to change, not just the IP. Family therapy, therefore, helps the family make interpersonal, intrapersonal, and environmental changes affecting the person using alcohol or drugs. It helps the nonusing members to work together more effectively and to define personal goals for therapy beyond a vague notion of improved family functioning. As change takes place, family therapy helps all family members understand what is occurring. This out-in-the-open understanding removes any suspicion that the family is "ganging up" on the person abusing substances. A major goal of family therapy in substance abuse treatment is prevention––especially keeping substance abuse from moving from one generation to another. Study after study shows that if one person in a family abuses alcohol or drugs, the remaining family members are at increased risk of developing substance abuse problems. The single most potent risk factor of future maladaption, predisposition to substance use, and psychological difficulties is a parent's substance-abusing behavior (Johnson and Leff 1999). A "healthy family structure can prevent adolescent substance abuse even in the face of heavy peer pressure to use and abuse drugs" (Kaufman 1990a , p. 51). Further, if the person abusing substances is an adolescent, successful treatment diminishes the likelihood that siblings will abuse substances or commit related offenses (Alexander et al. 2000). Treating adolescent drug abuse also can decrease the likelihood of harmful consequences in adulthood, such as chronic unemployment, continued drug abuse, and criminal behavior. Because of the variety of family therapy models, the diverse schools of thought in the field, and the different degrees to which family therapy is implemented, multiple therapeutic factors probably account for the effectiveness of family therapy. Among them might be acceptance from the therapist; improved communication; organizing the family structure; determining accountability; and enhancing impetus for change, which increases the family's motivation to change its patterns of interaction and frees the family to make changes. Family therapy also views substance abuse in its context, not as an isolated problem, and shares some characteristics with 12-Step programs, which evoke solidarity, self-confession, support, self-esteem, awareness, and smooth re-entry into the community. Still another reason that family therapy is effective in substance abuse treatment is that it provides a neutral forum in which family members meet to solve problems. Such a rational venue for expression and negotiation often is missing from the family lives of people with a substance problem. Though their lives are unpredictable and chaotic the substance abuse—the cause of the upheaval and a focal organizing element of family life—is not discussed. If the subject comes up, the tone of the exchange is likely to be accusatory and negative. In the supportive environment of family therapy, this uneasy silence can be broken in ways that feel emotionally safe. As the therapist brokers, mediates, and restructures conflicts among family members, emotionally charged topics are allowed to come into the open. The therapist helps ensure that every family member is accorded a voice. In the safe environment of therapy, pent-up feelings such as fear and concern can be expressed, identified, and validated. Often family members are surprised to learn that others share their feelings, and new lines of communication open up. Family members gain a broader and more accurate perspective of what they are experiencing, which can be empowering and may provide enough energy to create positive change. Each of these improvements in family life and coping skills is a highly desirable outcome, whether or not the IP's drug or alcohol problems are immediately resolved. It is clearly a step forward for the family of a person abusing substances to become a stable, functional environment within which abstinence can be sustained. To achieve this goal, family therapy facilitates changes in maladaptive interactions within the family system. The therapist looks for unhealthy relational structures (such as parent-child role reversals) and faulty patterns of communication (such as a limited capacity for negotiation). In contrast to the peripheral role that families usually play in other therapeutic approaches, families are deeply involved in whatever changes are effected. In fact, the majority of changes will take place within the family system, subsequently producing change in the individual abusing substances. Family therapy is highly applicable across many cultures and religions, and is compatible with their bases of connection and identification, belonging and acceptance. Most cultures value families and view them as important. This preeminence suggests how important it is to include families in treatment. It should be acknowledged, however, that a culture's high regard for families does not always promote improved family functioning. In cultures that revere families, people may conceal substance abuse within the family because disclosure would lead to stigma and shame. While there are limited studies of the effectiveness of family therapy in the treatment of substance abuse, important trends suggest that family therapy approaches should be considered more frequently in substance abuse treatment. Much of the federally funded research into substance abuse treatment has focused on criminal justice issues, co-occurring disorders, and individual-specific treatments. One reason is that research with families is difficult and costly. Ambiguities in definitions of family and family therapy also have made research in these areas difficult. As a result, family therapy has not been the focus of much substance abuse research. However, evidence from the research that has been conducted, including that described below, indicates that substance abuse treatment that includes family therapy works better than substance abuse treatments that do not (Stanton et al. 1982). It increases engagement and retention in treatment, reduces the IP's drug and alcohol use, improves both family and social functioning, and discourages relapse. • Bukstein (2000, p. 74) found that "family-focused interventions are empirically well-supported for youth with a conduct disorder or substance use disorder." He notes that 68 percent of adolescents with a substance use disorder also had a comorbid disruptive behavior disorder. Bukstein emphasizes that family therapy interventions can focus on the environmental factors that promote both disorders. • Catalano et al. (1999) sought to determine whether family-focused interventions for parents on methadone would reduce their drug use and prevent children from starting to use drugs. After studying 144 methadone-treated parents with 78 children for a year, with 33 sessions of family training, the authors found significant improvements in parenting skills, less parental drug use, fewer deviant peers, and better family management. • Cunningham and Henggeler's 1999 overview of multisystemic therapy, a family-based treatment model, found high rates of substance abuse treatment completion among youth with serious clinical problems. • Diamond et al. (1996) reviewed advances in family-based treatment research. They cited a growing body of research indicating that family-based treatments are effective for a variety of child and adolescent disorders, including substance abuse, schizophrenia, and conduct disorder. The studies all demonstrated the superiority of brief family treatment over individual and group treatments for reducing drug use. • Friedman et al. (1995) conducted a study of 176 adolescent drug abuse clients and their mothers in six outpatient drug-free programs with family therapy sessions. The authors found that the more positively the client described the family's functioning and relationships at pretreatment, the more client improvement was reported by client or mother at follow-up. They concluded that the adolescents with better treatment outcomes began treatment with more positive perceptions of their families. • In a review of controlled treatment outcome research, Liddle and Dakof (1995a) found that different types of family intervention can engage and retain people who use drugs and their families in treatment, significantly reduce drug use and other problem behaviors, and enhance social functioning. They also concluded that family therapy was more effective than therapy without families, but cautioned against overgeneralizing this finding because of methodological limitations and the relatively small number of studies. • McCrady and Epstein (1996) noted that an extensive literature supports family-based models and the effectiveness of treatments based on the family disease, family systems, and behavioral family models. Research knowledge is limited, however, by a lack of attention to cultural, racial, sexual, and gender orientation issues among subjects; the lack of couples treatment research on people using drugs; and the lack of family treatment research on individuals with alcohol abuse disorders. • O'Farrell and Fals-Stewart (2000) concluded that behavioral couples therapy led to more abstinence and better relationships, decreased the incidence of separation and divorce, reduced domestic violence, and had a favorable cost/benefit ratio compared to individual therapy. • Shapiro (1999) describes La Bodega de la Familia, a family therapy approach used to reduce relapse, parole violations, and recidivism for individuals released from prison and jail. With intensive family-based therapies, the 18-month rearrest rate dropped from 50 to 35 percent. • In a study using both family and non-family treatments for substance abuse, Stanton and Shadish (1997) concluded that (1) when family–couples therapy was part of the treatment, results were clearly superior to modalities that do not include families, and (2) family therapy promotes engagement and retention of clients. • Walitzer (1999) analyzed two forms of family therapy (behavioral marital therapy and family systems therapy) for treating substance abuse, concluding that the model of choice depended on the problem at hand. If problems (such as poor communication) centered in the marriage, behavioral marital therapy was the better approach. If the problem involved a whole family organized around alcohol or illicit drugs, family systems therapy could be a superior strategy. In either case, her review "strongly indicates the critical role family functioning can have in both subtly maintaining an addiction and in creating an environment conducive to abstinence" (Walitzer 1999, p. 147). Family therapy is more complex than nonfamily approaches because more people are involved. Family therapy takes special training and skills beyond those typically required in many substance abuse treatment programs. Relatively little research-based information is available concerning effectiveness with subsets of the general population, such as women, minority groups, or people with serious psychiatric problems (O'Farrell and Fals-Stewart 1999). The balance, however, certainly tips in favor of a family therapy in treating substance abuse. Based on effectiveness data and the consensus panel's collective experience, the consensus panel recommends that substance abuse treatment agencies and providers consider how they might incorporate family approaches, including age-appropriate educational support services for their clients' children, into their programs. Only a few studies have assessed the cost benefits of family therapy or have compared the cost of family therapy to other approaches such as group therapy, individual therapy, or 12-Step programs. A small but growing body of data, however, has demonstrated the cost benefits of family therapy specifically for substance abuse problems. Family therapy also has appeared to be superior in situations that might in some key respect be similar to substance abuse contexts. For example, Sexton and Alexander's work with functional family therapy (so called because it focuses its interventions on family relationships that influence and are influenced by, and thus are functions of, positive and negative behaviors) for youth offenders found that family therapy nearly halved the rate of re-offending—19.8 percent in the treatment group compared to 36 percent in a control group (Sexton and Alexander 2002). The cost of the family therapy ranged from $700 to $1,000 per family for the 2-year study period. The average cost of detention for that period was at least $6,000 per youth; the cost of a residential treatment program was at least $13,500. In this instance, the cost benefits of family therapy were clear and compelling (Sexton and Alexander 2002). Other studies look at the offset factor; that is, the relationship between family therapy and the use of medical care or social costs. Fals-Stewart et al. (1997) examined social costs incurred by clients (for example, the cost of substance abuse treatment or public assistance) and found that behavioral couples therapy was considerably more cost effective than individual therapy for substance abuse, with a reduction of costs of $6,628 for clients in couples therapy, compared to a $1,904 reduction for clients in individual therapy. Chronic diseases are costly and emotionally draining. Substance abuse is similar to a chronic disease, with potential for recovery; it even can lead to improvement in family functioning. Other cost benefits result from preventive aspects of treatment. While therapy usually is not considered a primary prevention intervention, family-based treatment that is oriented toward addressing risk factors may have a significant preventive effect on other family members (Alexander et al. 2000). For example, it may help prevent substance abuse in other family members by correcting maladaptive family dynamics. Family therapy for substance abuse treatment demands the management of complicated treatment situations. Obviously, treating a family is more complex than treating an individual, especially when an unwilling IP has been mandated to treatment. Specialized strategies may be necessary to engage the IP into treatment. In addition, the substance abuse almost always is associated with other difficult life problems, which can include mental health issues, cognitive impairment, and socioeconomic constraints, such as lack of a job or home. It can be difficult, too, to work across diverse cultural contexts or discern individual family members' readiness for change and treatment needs. These circumstances make meaningful family therapy for substance abuse problems a complex and challenging task for both family therapists and substance abuse treatment providers. Modifications in the treatment approach may be necessary, and the success of treatment will depend, to a large degree, on the creativity, judgment, and cooperation in and between programs in each field. Clinicians treating families have to weigh many variables and idiopathic situations. Few landmarks may be apparent along the way; for many families, the phases of family therapy are neither discrete nor well defined. This uncertain journey is made less predictable because multiple people are involved. For example, in an adolescent program, a child in treatment might have a parent with alcoholism. As the parent's substance abuse issues begin to surface, the child is withdrawn from treatment. This is why children need to participate in a group of their own. In a family therapy program, the child's and the parent's substance abuse problems would be addressed concomitantly. Another factor that can complicate any therapy process is external coercion, such as court-mandated treatment or mandates arising out of child protective services requirements. These situations can affect families in varied ways; treatment providers should approach mandated family therapy with heightened vigilance about the role of coercion in family process. Often in substance abuse treatment, a legal mandate or some other form of coercion makes therapy a requirement. The nature of mandated treatment is likely to have an effect on the dynamics of family therapy. It can place constraints on the therapist and raise distracting issues that have a negative effect on treatment, requiring more care, coordination of services, and case management. The legal and ethical thicket is dense in these circumstances. An exception is when the client is a minor, the courts can mandate treatment and family therapy. Practitioners should avail themselves of all relevant resources (e.g., professional associations, supervision, ethical guidelines, local and State legal and consumer organizations) before venturing to treat families under court order or similar situations. Therapists must form a working alliance with each family member and establish trust with the family so that sensitive information can be disclosed. This requires the therapist to demonstrate that she is on the family's side therapeutically, but she also needs to disclose to the family any other obligations she has as a result of her position. For example, by agreeing to treat the family under the particular circumstances at hand, the therapist might be obligated to make progress reports to probation or parole agencies. Even though an individual with a substance use disorder generally brings a family into treatment, it is possible that more than one person in the family has substance abuse problems, mental illness, problems with domestic violence, or some other major difficulty. Substance abuse, in fact, may be a secondary reason for referral for therapy. Changing the family's maladaptive patterns of interaction may help to correct psychosocial problems among all family members. For more information about co-occurring mental and substance use disorders see the forthcoming TIP Substance Abuse Treatment for Persons With Co-Occurring Disorders (Center for Substance Abuse Treatment [CSAT] in development k). Other important considerations involve the biological and physiological aspects of addiction and recovery. The recovery process varies according to the type of drug, the extent of drug use, and the extent of acute and chronic effects. Recovery also may depend, at least partly, on the extent to which the drugs are intertwined with antisocial behavior and co-occurring conditions. For the IP, post-acute withdrawal symptoms also will commonly present and interfere with family therapy for a significant period before gradually subsiding. The biological aspects of addiction also may affect the type of therapy that can be effective. For example, family therapy may not be as effective for someone whose drug use has caused significant organic brain damage or for a person addicted to cocaine who has become extremely paranoid. Severe psychopathology, however, should not automatically exclude a client from family therapy. Even in these cases, with appropriate individual and psychopharmacological treatment, family therapy may be helpful (O'Farrell and Fals-Stewart 1999) since other members of the family might need and benefit from family therapy services. The socioeconomic status of a family in treatment can have far-reaching ramifications. During treatment, poverty has two immediate implications. First, therapy will need to address many survival issues—a therapist cannot explore aspects of family systems or cognitive–behavioral traits if a family is being evicted, is not eating properly, is without financial resources and employment, or is experiencing some other threat to daily life. Second, the reimbursement systems that can be accessed probably will determine how long treatment will continue, irrespective of client needs. Therefore, family therapy treatments for substance abuse must be designed to be relatively brief and to target aspects of the family's environment that may be maintaining the drug abuse symptomatology (e.g., Robbins et al. in press). In addition, family members should be referred to Al-Anon, Alateen, and NAR-Anon to enhance their potential for long-term recovery. To what extent is the family's divergence from mainstream norms a function of pathology or a different cultural background? How is the family arranged—hierarchically? Democratically? Within this structure, what are the communication patterns? How well is this family functioning? That is, to what extent can the family meet its own goals without getting in its own way? What therapeutic goals are appropriate? What are the culture's prescribed roles for each family member? Who are the appropriately defined "power figures" in the family? The need for cultural competence does not imply that a therapist must belong to the same cultural group as the client family. It is possible to develop cultural competence and work with groups other than one's own. A sensitive therapist pays attention, senses cultural nuances, and learns from clients. Even when the therapist is from the same culture as the family in treatment, trust cannot be assumed. It must be built. The expectations regarding the therapist's role as an agent of change must be clearly discussed in relation to the developing trust with the family and individual members. Issues related to cultural sensitivity and appropriateness are considered in greater detail in chapter 5 and in the forthcoming TIP Improving Cultural Competence in Substance Abuse Treatment (CSAT in development b). Individuals typically progress and regress in their movements through these stages (Prochaska et al. 1992). Although these stages can be applied to a whole family, not every family member necessarily will be at the same stage at the same time. The therapist needs to address where each family member is, for these factors play an important role in assessment and treatment matching decisions. For additional information on the stages of change, refer to chapter 3 of this TIP and see also TIP 35, Enhancing Motivation for Change in Substance Abuse Treatment (CSAT 1999b ). Dry abstinence is a time when clients must cope with problems revolving around the cessation of substance use (such as withdrawal, sudden realization of the actual damage intoxication has caused, and the shame that follows). Sobriety, or early recovery, concentrates on maintaining freedom from substances. Bit by bit, the client is helped to substitute health-sustaining behaviors for relationships and circumstances that precipitate substance use. Advanced recovery shifts from support to examination of underlying personal issues that predispose the client to substance use. Trust and intimacy are re-established, and the client moves through the termination of therapy. Attainment of sobriety. The family system is unbalanced but healthy change is possible. Adjustment to sobriety. The family works on developing and stabilizing a new system. Long-term maintenance of sobriety. The family must rebalance and stabilize a new and healthier lifestyle. Combining these two models provides a simple, straightforward categorization for a family's progress in recovery regarding attainment of, adjustment to, and long-term maintenance of sobriety. For additional information on these phases of family change, see chapter 4. At present, research cannot guide treatment providers about the best specific matches between family therapy and particular family systems or substances of abuse. Research to date suggests that certain family therapy approaches can be effective, but no one approach has been shown to be more effective than others. In addition, even though the right model is an important determinant of appropriate treatment, the exact types of family therapy models that work best with specific addictions have not been determined. However, a growing body of evidence over the past 25 years suggests that children benefit from participating in age-appropriate support groups. These can be offered by treatment programs, school-based student assistance programs, or faith-based communities. Experience and sound judgment can distinguish many situations in which family therapy alone would or would not be a workable modality. Treatment must be customized to the needs of each family and the person abusing substances. An adolescent who is primarily smoking marijuana, for instance, is a good candidate for family systems work. On the other hand, if a youth is mixing cocaine, amphetamines, alcohol, and other drugs, the client is likely to need more extensive services—detoxification, residential treatment, or intensive outpatient therapy––which can be used in addition to family therapy (Liddle and Hogue 2001). Only in rare situations is family therapy inadvisable. Occasionally, it will be inappropriate or counterproductive because of reasons such those as mentioned above. Sometimes, though, family therapy is ruled out due to safety issues or legal constraints. Family or couples therapy should not take place unless all participants have a voice and everyone can raise pertinent issues, even if a domineering family member does not want them discussed. Family therapy can be used when there is no evidence of serious domestic or intimate partner violence. Engaging in family therapy without first assessing carefully for violence can lead not only to poor treatment, but also to a risk for increased abuse. It is the treatment provider's responsibility to provide a safe, supportive environment for all participants in family therapy. Children benefit by attending support groups specifically for them; it is important to create a safe environment in which they can discuss family violence, abuse, and neglect. Usually, a way can be found to include even the family member who has turned to violence as a way of dealing with problems. That person is a vital part of the family and will be pivotal in understanding the nature of the family violence. For example, Johnson (1995) distinguishes between common couple violence and patriarchal terrorism. The former is characterized by occasional violent outbursts by either spouse and is not likely to escalate. It is usually an intermittent response to conflict, and in therapy can be examined and channeled into more positive expression. Patriarchal terrorism, however, is systematic male violence with the goal of control. It may not be possible or advisable to include a chronically violent partner in the family therapy process. Child abuse or neglect is another serious consideration. Children in violent homes have more physical, mental, and emotional health problems than do children in nonviolent homes. Children of people with alcohol abuse disorders suffer more injuries and poisonings than do children in the general population. Research has shown that when families exhibit both of these behaviors—substance abuse and child maltreatment—the problems must be treated simultaneously to ensure a child's safety. It should be noted that the withdrawal experienced by parents who cease using alcohol or drugs presents specific risks. The effects of withdrawal often cause a parent to experience intense emotions, which may increase the likelihood of child maltreatment. During this time, it is especially important that family support resources be made available to the family (Bavolek 1995), and that children know how to find safe adults to help. Any time a counselor suspects child abuse or neglect, laws require immediate reporting to local authorities. For further information, see TIP 36, Substance Abuse Treatment for Persons With Child Abuse and Neglect Issues (CSAT 2000b ). Domestic violence is a serious issue among people with substance use disorders, and it must be factored into therapeutic considerations. If, for example, a restraining order prohibits spouses from seeing each other, the treatment provider must work within this limitation, using therapeutic configurations that make sure that a client who is abusive is not in a session with the person he or she has been barred from seeing. Often when there is concomitant family violence, the offender is mandated to complete a Batterer's Intervention Program before participating in any couple's work. At the same time, the victim/spouse is engaged in safety planning and sometimes treatment for his or her own issues. Only the most extreme anger contraindicates family therapy. Kaufman and Pattison (1981) developed the concept of the need for a period of abstinence before sufficient trust can be built to counteract the anger. Including all family members in treatment and providing them a forum for releasing their anger may help to work toward that threshold. Redefining the problem as residing within the family as a whole can help transform the anger into motivation for change. In turn, this motivation can be used to restructure the family's interactions so that the substance abuse is no longer supported. The therapist's ability to reframe proposed obstructions by family members is often the key to creating a positive therapeutic direction. It is up to counselors and therapists to assess the potential for anger and violence and to construct therapy so it can be conducted without endangering any family members. Because of the life-and-death nature of this responsibility, the consensus panel includes guidelines for the screening and treatment of people caught up in the cycle of family violence. These recommendations, adapted from TIP 25, Substance Abuse Treatment and Domestic Violence (CSAT 1997b ), are presented in appendix C. However, these guidelines are not a substitute for training; counselors and therapists should have training and supervision in handling family violence cases. If, during the screening interview, it becomes clear that a batterer is endangering a client or a child, the treatment provider should respond to this situation before any other issue and, if necessary, suspend the rest of the screening interview until the safety of the client can be ensured. The provider should refer the client or child to a domestic violence program and possibly to a shelter and legal services, and should take necessary steps to ensure the safety of affected children. Any outcry of anticipated danger needs to be regarded with the utmost seriousness and immediate precautions taken. The integration of family therapy into substance abuse treatment is an important development in the treatment of addictions. Historically, barriers have separated the fields, among them differences in credentialing, treatment models, and cost for higher-trained family therapists. This TIP is intended to provide an opportunity for providers from both disciplines to learn from one another. It provides language that will help both fields talk about family therapy and addiction and facilitate a new and more collaborative way of thinking about substance abuse treatment. In many States and jurisdictions, credentialing requirements are raising standards for substance abuse counselors and family therapists. These changes, which will require further education, provide opportunities for practitioners to expand their horizons as they upgrade their professional skills. This process can further cross-fertilize the fields by making the practitioners of both fields more familiar with each other's work. The consensus panel hopes that substance abuse treatment and family therapy practitioners will be able to use this TIP to help educate insurers and behavioral managed care organizations about the importance of covering family therapy services for clients with substance use disorders. This TIP will help family therapists become more aware of the presence and significance of chemical dependency and work with the substance abuse treatment community so family environments no longer contribute to or maintain substance abuse. It also is hoped that family therapists will come to appreciate models of substance abuse treatment and the context in which they are delivered. Clinical supervisors in substance abuse treatment programs and in family treatment programs can use this information to become aware of and knowledgeable about the potential connections between substance abuse treatment and family therapy. These supervisors will then be better equipped to incorporate appropriate family approaches into their programs and evaluate the performance of personnel and programs in both disciplines. Realizing how beneficial family therapy can be as an adjunct to or integrated part of substance abuse treatment, program administrators can use the TIP to train and motivate substance abuse treatment clinicians to include family members in treatment. 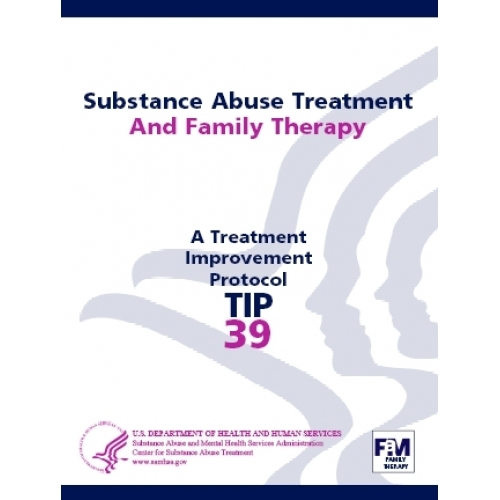 Likewise, program administrators in family treatment programs can use the TIP to motivate and train family therapists to include the exploration of substance use disorders in family treatment. Since it is difficult to find counselors who are expert in both fields, it is hoped that substance abuse treatment administrators will develop collaborative relationships with family therapy programs and manage necessary logistical issues. For example, finding adequate space is often an issue. Working hours, too, may have to be shifted, because staff will need to work some evenings to meet with family members. Why is treatment being pursued now? What are the costs and benefits of engaging in therapy now? How is "change" defined in the structure of "progress" in therapy? What are the key components of treatment for the family?